I've just purchased an Alladinbox SkyCube 3D that I want to use to print board game miniatures and other fun stuff. 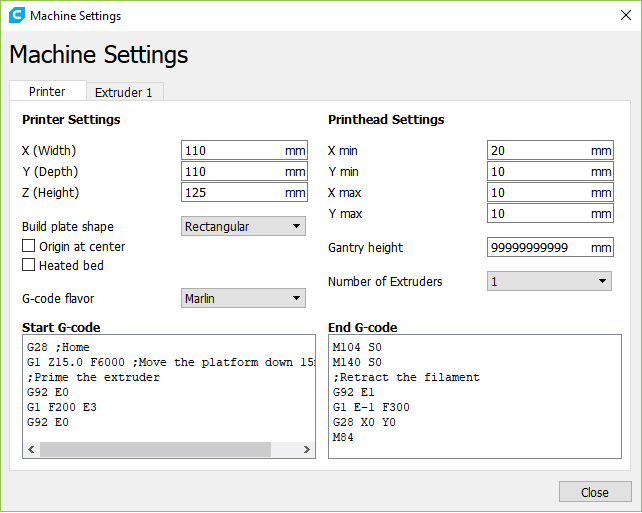 However, the instructions do not give the settings I need to put into software like Ultimaker Cura, and this is where I need some help so that I can generate the G-code files from models I download from MyMiniFactory. I know it uses PLA and the extrusion temperature should be 210°C. However, I need help with the other settings. Can someone please point me in the right direction? Is there a better software I could be using? Where can I find settings? UPDATE: For those wondering "what" settings, I would probably start with the printer and extruder specifications. The following is my best guess. Okay, after some research and experimentation, I've come up with some settings that seem to work. Note: There is NO cooling fan present and the base is NOT heated. I'm using the PLA supplied with the printer so far, and it works well at a nozzle temperature of 210C. I'm printing at 0.2 mm per layer, which seems to afford to a good level of detail. I've printed a scanned Greco-Roman basin, and the details are very nice indeed. So far I'm using a 20% line filling, and this seems to give the structure a good solidity and strength. I'm also operating the nozzle at its maximum speed of 70 mm/s and it seems to work just fine. Obviously, I'm still experiments, and different materials may require different settings, but overall I'm very happy. I hope this post helps someone. 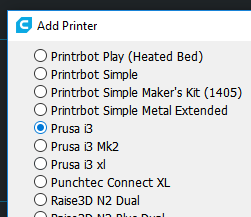 To start printing with Cura, you can select standard printer (aka Prusa i3) and set the x,y,z dimensions in the machine properties window - it is a safe point to start. Then you could print a test cube and try to dial in with speed/temperature setting to get the best quality. Ultimaker Cura comes with pre-defined profiles for various materials. PLA filament is present in between them. This could be a good starting point to derive your specific profile for your own material. To do we usually print test objects and look at the quality of the product. Test prints can consist of simple X-Y-Z test cubes, temperature towers, retraction test prints, a "Benchy" or many more. Generally 210 degC is pretty high for PLA, but may sometimes be necessary when printing high speeds. Just copying the material profiles from someone else may not work for you as it might involve different printer brands and even within the filament brands variations in between rolls of a single line may require additional tweaking. 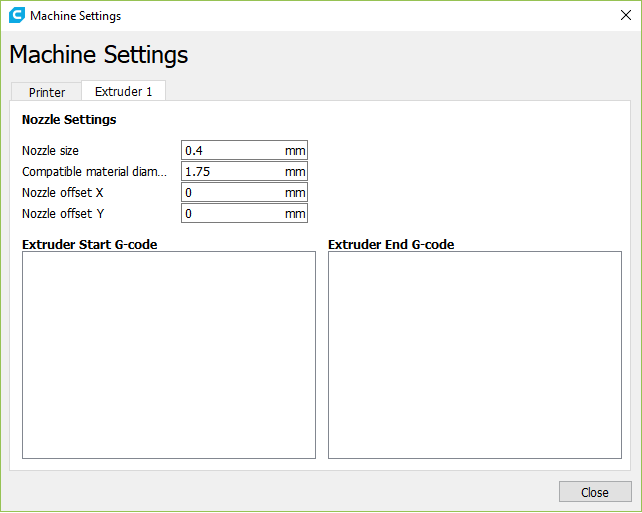 Edit: The original question appeared to hint at material settings, but the OP changed the question, hinting on printer settings with accompanying screenshots how to setup the printer in Cura. However, the OP's answer (that the OP accepted) also includes material and other slicing settings (infill, layer height, speed). To help other people I undeleted my answer which discusses using the standard Cura profiles to work on to make your own derivatives. How do I upgrade (copy settings) from Cura 2.5 to Cura 2.6?